KLA-Tencor, Lam Research, ASML and Teradyne have all seen their shares jump post-earnings. KLA's stock rose more than 10% on its positive earnings reports and guidance. 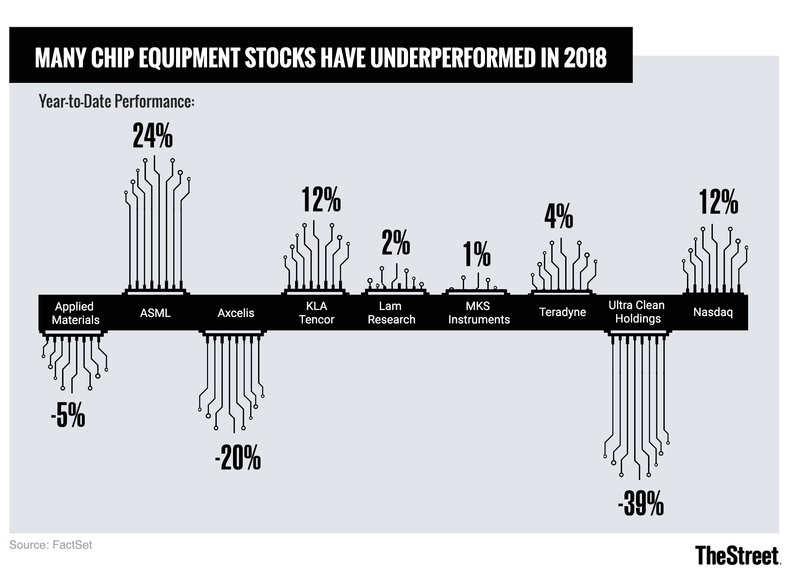 Leading chip equipment makers have done a pretty good job this earnings season of dispelling worst-case fears about their industry. And though the industry is unlikely to see huge growth in the coming years, moderate sales growth -- and somewhat better earnings growth, thanks to the operating leverage built into the business models of chip equipment makers -- could very well be good enough to drive chip equipment stocks higher given the low valuations many of them trade at following a choppy start to 2018. Here's a quick look at the calendar Q2 earnings reports of four major chip equipment firms: KLA-Tencor (KLAC - Get Report) , Lam Research (LRCX - Get Report) , ASML (ASML - Get Report) and Teradyne (TER - Get Report) . Applied Materials (AMAT - Get Report) , the world's biggest chip equipment maker, is set to deliver its July quarter report on August 16th. KLA's stock rose over 10% on Tuesday after the company beat estimates and issued above-consensus September quarter guidance. And on its earnings call, the company forecast industry wafer fab equipment (WFE) spend would rise by a mid-single digit percentage in 2018. That's down from a prior outlook for high-single to low-double digit growth, but better than feared given a mid-year slowdown in capital spending among memory and to some degree logic (processor) manufacturers. KLA, for its part, expects to see low-double digit revenue growth. The company notes its strong exposure to chip manufacturing processes making use of EUV lithography is giving it a lift -- Samsung (SSNLF and Taiwan Semiconductor (TSM - Get Report) , two of the world's three biggest chip equipment buyers along with Intel (INTC - Get Report) , plan to start mass-production for EUV-based processes in 2019. Also helping is healthy exposure to Chinese chip capex (expected to ramp next year), and the fact that cutting-edge memory processes often make heavy use of KLA's chip wafer inspection and metrology (measurement) tools. Lam's earnings report wasn't as stellar as KLA's: The company beat June quarter estimates, but also issued below-consensus September quarter guidance that was blamed on lower orders from memory and foundry (chip contract manufacturer) clients. In what's something of a positive for Micron (MU - Get Report) , Lam noted the "largest single [order] adjustments" happened in the DRAM space. However, like KLA, Lam expects industry demand to rebound in calendar Q4, and still forecast a modest amount of WFE spending growth this year. With expectations fairly low going into earnings, though, Lam's numbers and commentary were good enough for its stock to rise 7% following its report. Long-term, Lam is still aiming for fiscal 2021 (ends in June 2021) EPS of $23-$25, up from a fiscal 2018 level of $17.87. As the company notes, an industry mix shift towards memory WFE spend works to its advantage, given how extensively Lam's chip etching and materials deposition tools are used for newer memory processes. As the world's top provider of chip photolithography equipment, ASML has to a large degree been a play on EUV adoption. And the company's Q2 report and call offered fresh signs that following plenty of delays, EUV will soon be ready for primetime. ASML beat estimates, offered above-consensus Q3 guidance and disclosed that it shipped four costly EUV systems (one more than expected). The Dutch company also reiterated it expects to ship 20 EUV systems this year and "at least" 30 next year, and reported solid demand for traditional DUV lithography systems from memory clients. ASML's shares rose nearly 7% post-earnings, and made fresh highs. Stock buybacks are giving a boost to EPS: 269 million euros ($312 million) were spent on them in Q2, and ASML plans to buy back 2.5 billion euros worth of stock between 2018 and 2019. Leading chip test equipment maker Teradyne's shares had been crushed in late April thanks to soft Q2 guidance. However, shares gradually moved higher in May and June. Following a solid Q2 report that included above-consensus Q3 guidance, they've now fully recovered their losses. Unlike the aforementioned companies, Teradyne's products for the chip industry generally go into packaging and testing facilities rather than manufacturing plants (fabs), and thus tend to see different order dynamics. While soft demand from the mobile system-on-chip (SoC) testing market market has been weighing on Teradyne, the company reports seeing strong demand for memory testing systems, as well as systems used to test non-mobile SoCs and storage products. Teradyne also reported its Universal Robots unit, which makes robotic arms for industrial automation systems, saw revenue rise 45% annually to $57 million (11% of total revenue). In late June, Universal launched a new line of robots that feature more processing power than their predecessors.